This article explores the origins of the idea of Brahman as the Supreme Universal Self and what factors might have played a significant role in shaping that thought process and balancing the Vedic ritual tradition with a corresponding and exalted Upanishadic philosophy. The Chandogya Upanishad (4.16.1) mentions two methods to perform sacrifices, "by the mind and by speech." Of them, the Brahman priest performs it by the mind and the other is performed by the Hotri, Adhavaryu and the Udgatri priests. The subsequent verses then go on to explain how a sacrifice is injured if the Brahman priest breaks his silence during the sacrifice and how to rectify the injury. Through these verses, the Upanishad, which is reckoned one of the earliest in terms of its historicity, throws light upon an important practice of Vedic sacrifices and its role in the development of Vedanta and the conception of creation as a sacrifice with Brahman as its silent presiding Deity. With the emergence of these new ideas, the Vedic seers began to perceive an underlying unity in the diversity of creation. They realized that the multiple gods who were worshipped in the sacrifices were indeed manifestations of one Supreme entity who held them all as their support. The emerging thought process and the conception of the Universal Being as the sum total of all existence is well reflected in a conversation recorded in the Brihadaranyaka Upanishad (3.9.9) between Yajnavalkya and Vidagdha Sakalya, in which Yajnavalkya speaks of the "three hundred and three, three thousand and three" deities present in the creation as just One Breathing Spirit only, "who blows as one and who becomes one and half by breathing." "Who is that deity?" asks Sakalya. Yajnavalkya replies, "He is Brahman. They call him, Tyat (That)." The early Vedic hymns contain invocations addressed to various individual gods but hardly any reference to an absolute and infinite being as the transcendental universal Self and the dweller of all. We find references to such a Being in the Upanishads and in the later Vedic schools of thought. The concept of Atman, as the presiding deity of the body and the silent Self within probably emerged during this period, replacing breath (prana) and food as the ultimate support. Atman became the breathing spirit, the breath of the breath. The body which was previously identified occasionally as the Self because His dwelling place, the microcosm. This was probably the culmination of the internalization of the Vedic rituals, as climate and circumstances both might have favored the flowering of such a revolutionary and transformative concept and minimized the physical exertion that was required to relate to the deities through loud chanting and expensive offerings. While the heaven stood far and above, beyond the physical reach of the mortals, the heaven within was much closer to one's own heart and the mind and could be reached through the channels of breath and the silence of the mind. No fanfare and ceremonial arrangements were also needed in such an internal ritual to invoke the deities or nurture them. One could replicate the beneficial effects of a sacrifice internally and instantly by invoking the deities within through the silence of the mind and visualization and by nurturing them through the offerings of food one made to the Self within. These developments resulted in a new philosophy and a new approach to religious worship. If there is a heaven it is inside you. If there are gods in creation, they must be existing in the inner universe of your own mind and body. With your own mind and body as the sacrificial place and with yourself as the host of the sacrifice and the priest, you can worship the Highest Being who is responsible for your creation and existence. These ideas elevated Vedic sacrifice into a great spiritual means to attain the source of all manifestation within oneself, transcending all barriers and limitations which death and impermanence implied. As the Vedic seers turned their attention inwardly and began searching for permanent answers to the transient problems of suffering, sickness, aging and death, they experienced the universal presence of the Supreme Self hidden in every aspect of creation and within themselves. The realization added a new perspective to their understanding and interpretation of rituals. In the sacrificial rituals they saw the model of creation. They envisioned the entire creation both as an act of sacrifice and a product of sacrifice in which the Supreme Self presided over as the priest, offering Himself to Himself and emerging out of it in innumerable forms and enveloping Himself in the mortal worlds in a fog of ignorance and illusion. The Vedic people performed rituals for material gains and protection against natural calamities. Knowledge of rituals enabled the priests to enjoy a special status in society. Their reputation and material success depended very much upon the efficacy of the rituals they performed. The rituals demanded a high degree of precision, perfection and purity on the part of the participants and the priests. The rituals were elaborate ceremonies whose efficacy depended upon several critical factors including selection of an auspicious time and place, preparation of the ritual place, knowledge of the Vedic hymns and the experience and expertise of the priests who conducted them. During the performance of the rituals the priests poured as offerings several animal and plant products such as rice, barley, clarified butter, curd, milk etc. into the sacred fire of the altar, chanting Vedic hymns. The fire symbolized Agni, the fire god, who acting as intermediary received the oblations and distributed them equally among other gods. For the Vedic people, the rituals provided an opportunity to establish contact with the immortal gods and communicate with them in their own language of Sanskrit through the sacred chants. The ritual place was the meeting ground where the higher beings joined forces with the mortals and participated in the human drama for the welfare of the world. As the Vedic seers turned their attention from the outward performance of the rituals to an inner life of meditation and contemplation, the imagery and the processes of rituals assumed symbolic significance and the Vedic thought developed in a language and medium that was familiar to the practitioners of rituals. In the earlier schools of Vedic thought, sacrifices symbolized man's ability to reach out to gods through systematic acts of sacrifice both outwardly and inwardly. Inwardly, the ritual stage represented the human body. The altar stood for the human head. Fire represented digestion, breath the air and the senses the gods. Indra, the leader of the gods represented the mind and Prajapati the higher mind. The offerings in the form of sense objects were first received by the mind (Indra) and then through the mind reached the various senses (gods). The emergence of the concept of Brahman as the highest and absolute God and his presence in creation as the inmost self of all beings and objects, elevated Vedic religion into a higher spiritual dimension. The internal ritual became more important than the external. In this reorientation of Vedic thought, the gods were recognized as subtle energies and sense organs, who, residing in the human body, fed upon the sense objects and acted more as obstacles rather than facilitators, providing transient joy and limited knowledge and distracting men from the higher purpose of knowing themselves. Brahman was now identified as everything, the ritual place, the altar, the priest who performed the rituals, the offerings, the offered and the very act of offering. All human actions, thoughts and objects with which the sense organs interacted were to be now offered not to the gods but to the all pervading and absolute Brahman as sacrificial offerings in a grand ritual called life. The supreme Self enveloped the whole creation, inhabited it as its true dweller and sustained it through various powers. The gods occupied a much lower status and remained mostly ignorant of Brahman, whose world was far superior to that of gods and of ancestors and which could be reached only by human beings through self-realization. The internalization of ritual in the l is well reference in the Brihadaranyaka Upanishad also in a conversation between Yajnavalkya and Asvala in the following versed (3.1.9). "Yajnavalkya," he said, "with how many gods does this Brahmana priest on the right protect the sacrifice today?" "With one." "Who is that one?" "The mind only. Truly, the mind is infinite, and infinite are the universal deities. An infinite world he gains by worshipping them in the mind." Just as the concept of ritual became internalized and the very existence of man was viewed as a symbolic act of sacrifice in a much larger sacrificial act of creation, the concept of Brahman as priest morphed into that of Brahman as an absolute and infinite being. The Brahman priest played an important role in the performance of rituals and maintained the continuity, integrity and purity of the rituals, helped by three other types of priests, the Hotri, Udgatri and Adhavaryu. The Hotri or Hotri priest initiated the rituals by inviting the gods to the ritual place with the chanting of the Rigvedic hymns. The Udgatri priest sang melodious hymns of praise and invocations from the Samaveda and kept the ritual place ready for the descent of the gods. 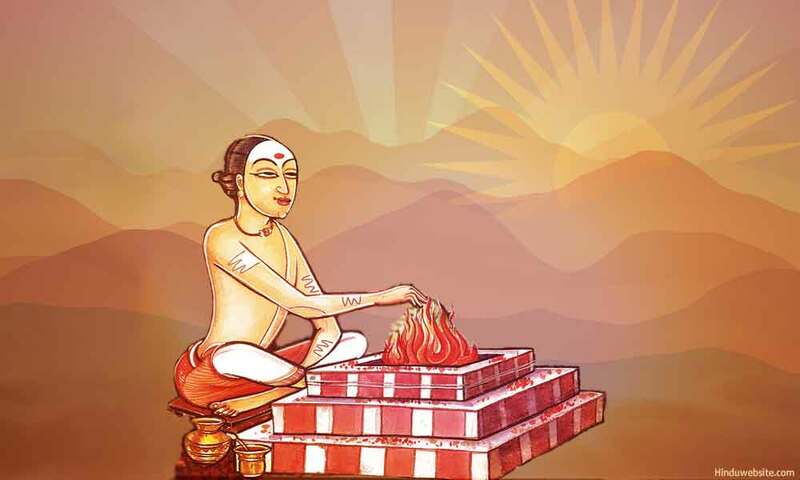 The Adhavaryu priest was responsible for the performance of the ritual proper according to the established procedure. He chanted hymns from the Atharaveda and with his knowledge ensured that the offerings were made correctly to the gods. The Brahman priest was responsible for the overall success of the ritual. He carried out supervisory and expiatory functions and acted as the binding thread between the external and internal aspects of the ritual. As an experienced and knowledgeable priest, he kept a watchful eye upon the activities of other priests, remaining silent throughout. His silence provided the continuity, during the official breaks when the priests were not required to chant any hymns. Most importantly he performed expiatory functions so that any mistakes on the part of other priests in their performance of the ritual were neutralized. Thus through his detached and silent presence the Brahman priest played a vital role in the performance of the ritual and its success. The silent, watchful and observant seer, the healer and expatiator who remained in the background in the performance of ritual but without whom the ritual could not be performed or completed fitted the description of Brahman perfectly and helped the seers to describe Him in familiar terms. As the silent and ever watchful witness consciousness, Brahman made possible the ritual of creation on a universal scale. He maintained its purity, continuity and integrity through the laws (dharma) He created and enforced. He kept a watchful eye upon the gods who acted as the priests in the heavenly realms and used Him in a sacrifice to create the worlds and their beings.